Category: Event Photography, Extra Stuff, Glamour photography, what's going on this month? Friday November 22nd will be Courtney’s Moonlight and Magic, 5th streets event to kick off Winterfest 2013 in Downtown. I will be joining the wonderful ladies at Secret Drawers Lingerie Ltd from 5:30-8:30pm for a glamourize your Facebook page event. I will have a small backdrop and chair set up at Secret Drawers, located at 431 5th Street, to photograph glamour head shots for all you beautiful ladies out there. This is a no-cost service for this great event. Swing by Secret Draws while you are out shopping on, what I hope, will be a crisp Friday evening, and have your glamour head shot taken for your Facebook profile, twitter profile or any other social media bio page you can think of. Nena and Vashti, the gorgeous ladies at Secret Drawers, have chosen The Great Gatsby as their theme for moonlight and magic this year. So keeping with the theme I will be creating and bringing with me 1920’s inspired props and accessories for your Facebook glamour head shots. Together we can Gatsby-up Facebook! You are not require to dress theme appropriate to have your picture taken, but if you do, you’ll be even more awesome! This isn’t just for the ladies, Guys you are welcome too! I’ll bring a couple of mobster hats and ties with me, just incase! How it works: Come to Secret Drawers on Friday November 22 between 5:30-8:30. When it’s your tun, pick an accessory, sit in my glamour chiar, and have 5-10 minutes of fun while I photograph you-you should leave feeling pretty darn good. Then shop around the store and take advantage of the great Moonlight and Magick deals, before you head back out to shop the evening away. When there is a lull (or after I close shop at 8:30) I will sort thought the head shots, pick your best one, do some quick glamour edits and then post a Glamour Head shots Event album to Gaia Magick ‘s Facebook page. From there you can use the watermarked image on any social media site for a profile picture. 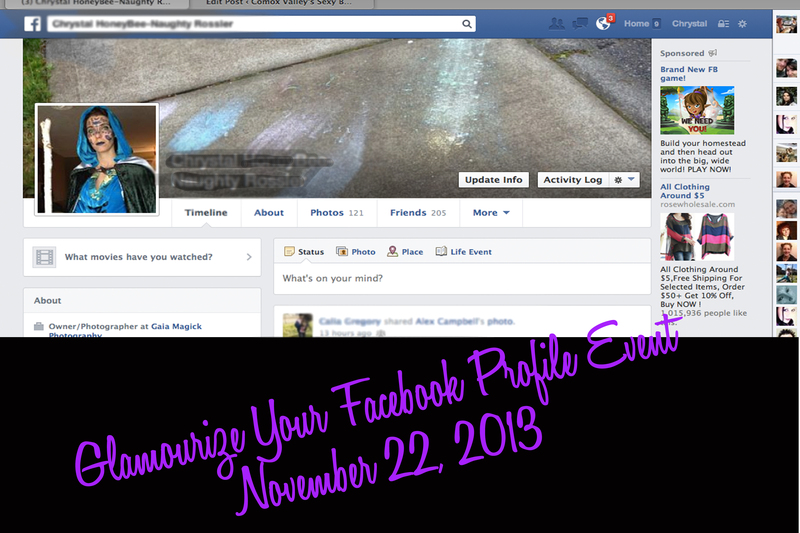 This will be a first come first serve event, so get there early to ensure your Facebook profile image. And while you are there, why not browse those all the wonderful underthings and jammies Secret Drawers has to offer. I will also have session and product gift vouchers available to purchase. These will be available at the event for less than the stated retail value on the voucher. Purchase something for yourself, or get a great gift for someone you love. This holiday season shop local! Let’s help our community thrive.